KB science is intuitive because it is based on the RDF - the graph of how many of molecule i are surrounding molecule j, where, as in this case, j may be the same as i, indicating how much the molecule likes to be around itself. If the RDF (shown as gij) is large, that means that molecules like being together. In fact we have to take into account the available volume at a given distance, giving us the desired Gij values. Here we use a very simple RDF, though it involves a bunch of rather meaningless parameters. It doesn't matter what they mean, what matters is the overall shape which your own intuition will tell you is "this molecule likes being with itself" or not. Using this simple case will allow you to imagine what would happen with the RDF of real molecules and how that would give a large, positive Gij (the molecules are happy together) or a negative one (unhappy). One tip. If both molecules are large then they can't get too close, so their Gij values will be lower. This is the "Excluded Volume" effect. It sounds trivial, yet it is one of the more powerful solubility effects you will meet. The joy of KB is that Excluded Volume is so obvious; in other solubility schemes it is very confusing and obscure. In molecular thermodynamics, the Radial Distribution Function, RDF, tells you a lot about what is going on in the solution. 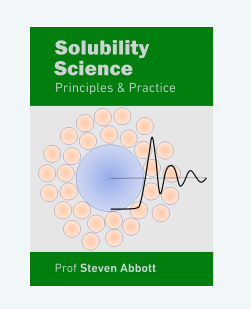 If we could only calculate them accurately, most of our solubility problems would disappear. Unfortunately, in general we cannot calculate them and we certainly cannot calculate them accurately. We will see why this second point is important. where ρij(r) is the number density at distance r and ρij0 is the bulk density. The standard liquid used to show an RDF is "Lennard-Jonesium", made up of Lennard-Jones particles. A convenient parameterised model for such RDFs comes from Matteoli and Mansoori1 where the 6 parameters each affect a different aspect of the RDF. RDFs tend to be plotted with respect to the radius of the particle, R. Here the plot is to absolute R, though the default value of R is assumed to be 1. As this is an illustration, the units are not specified. where the 4πr² captures the surface area of each "shell" at a given r. The integral is from 0 to infinity, but it is generally hoped that the value stabises at a more realistic value such as r=10 in the default settings. It is the 4πr² which causes a lot of problems for thermodynamics. The default values show a gij which oscillates briefly then flat-lines uninterestingly up to the cut-off radius of 10. Because of the amplification by 4πr², the Gij does not level off so quickly and it takes much longer for the integral to stabilise. Worse than that, trivially small changes (to the human eye) in gij can lead to large changes in the asymptote value of Gij. Try, for example, adjusting θ. This controls the exponential function to the left of the first peak. With perfect hard spheres the peak has an abrupt cut-off at the sphere radius, but real molecules have some fuzziness at this point. It is usually hard to see much happe when θ changes, but the Gij value changes significantly. In other words, calculated thermodynamic values (which come from Gij) are exquisitely sensitive to small changes in gij. So if molecular dynamics are used to calculate the RDF, small changes in the force fields can lead to large changes in the computed thermodynamic values, especially if the integral is ended at some "reasonable" value which (try adjusting the Cut-off value) turns out to be too soon. It is so obvious that the RDF must be zero inside the contact radius of the molecules that we hardly notice it. Yet this "excluded volume" can have significant thermodynamic effects. For example, the impact of large sugar molecules on the folding behaviour of proteins in solution is largely due (via a not-so-obvious chain of logic) to the fact that where there is a sugar molecule there isn't a water molecule.